In the Southwest region of Texas, Arizona, Oklahoma and New Mexico, asbestos exposure is prevalent and has led to thousands of mesothelioma diagnoses. There are 122 asbestos sites in the southwest region, with most located in AZ’s Gila county. Across these states, 3,608 Americans died of mesothelioma from 1999 to 2015. TX, OK and AZ have a statute of limitations of 2 years, while NM's is 3 years. The Southwest’s economy largely relies on industries known to have used asbestos. Asbestos use has a long history in the Southwest, particularly in Arizona where various asbestos mines began operating back in the early 1900s. Even in Oklahoma, where there are no natural asbestos sites recorded, the mineral leached into various industries and put workers at risk of exposure. Texas and New Mexico also have a few asbestos sites, though even with less natural asbestos, Texas suffers among the most mesothelioma deaths in the nation. Due to the natural deposits and wide use of asbestos, all four states have seen a high rate of mesothelioma diagnoses. In a recent study from the Journal of the American Medical Association looking at changes in cancer mortality rates from 1980 – 2014, researchers found for the most part all four states saw various increases in mesothelioma mortality throughout the period. Central Arizona in particular saw a large increase in mortality rate, with some areas seeing an increase by 80% or more. Overall, these four states make up about 8.5% of all the mesothelioma deaths in the nation between 1999 and 2015. Together, the states experienced 3,608 deaths from mesothelioma. Throughout this region, there are many mesothelioma specialists and treatment centers with great experience in treating this rare cancer. 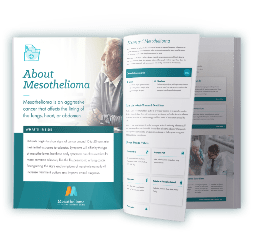 Mesothelioma patients in this area should seek the help of a qualified doctor, as they will be able to decide the best course of treatment for an individual’s case. Many of these treatment centers, like Baylor College of Medicine in Texas, are also involved in ongoing research for new, effective treatments. Clinical trials can offer a promising opportunity for mesothelioma patients to find more curative options and potentially extend their survival. Across these four states, 122 instances of asbestos can be found, including natural deposits, former mines, and sites considered as prospects for mining. By far, Arizona has the most recorded occurrences of asbestos, most of which were located in Gila county. The Salt River Canyon on its own boasts 90 asbestos deposits. Texas and New Mexico also have several natural asbestos deposits. New Mexico has six natural deposits of chrysotile and amphibole asbestos, largely found in the southwestern region of the state. Texas also has six natural deposits of asbestos located in Hudspeth, Gillespie and Blanco counties. Because of the abundance of asbestos in Arizona, mining became a huge industry. According to the Arizona Geological Survey, in the course of 50 years, 160 operating mines in the Salt River Canyon area extracted over 75,000 pounds of asbestos. Though the last mine in the United States closed in 2002, and operations like this in Arizona ceased by the early 1980s, workers in these mines faced exposure every day. Even miners of other materials, like gold and iron in New Mexico, risked potential exposure in asbestos-contaminated mines. In addition to mining, there are many other industries in this region that made use of asbestos in their buildings, equipment, or even products. New Mexico, Oklahoma and Texas in particular are big producers of oil for the country, and it remains an important economic industry for them today. Manufacturing, especially in Arizona, and agriculture in Oklahoma also have a large impact on these state’s economy, but have been known to cause asbestos exposure. Mesothelioma victims or their surviving family members may be eligible to file a claim to recover money from treatment expenses and the pain and suffering such a diagnosis can cause. An experienced mesothelioma lawyer will be able to guide you through the process and determine the best course of action for you and your family. When considering filing a claim, it’s important to note there is only a short time frame available to seek compensation after diagnosis or after a loved one has passed away. Missing these deadlines can mean losing your right to compensation. Contact a mesothelioma lawyer today to determine what kind of claims you might be eligible for and begin gathering evidence as soon as possible. While asbestos is still not banned in the United States, its use is strictly regulated. Most states, including New Mexico and Oklahoma, adhere closely to the federal laws in place, like the EPA’s National Emission Standards for Hazardous Air Pollutants (NESHAP), and don’t have any additional state regulations. Arizona also largely follows federal regulations, though Maricopa, Pinal and Pima counties oversee their area’s adherence to these laws and have some additional regulations. Residents and companies in those counties must adhere to both the federal and county level laws. Texas has also passed additional asbestos regulations to go beyond some of the NESHAP requirements in regard to the licensing of asbestos professionals, workplace safety measures and demolitions or renovation projects. The Texas Asbestos Health Protection Act passed in June 2003 and updated several areas of the laws, like licensing requirements, in 2016. New Mexico is the only state in the Southwest that doesn’t cover mesothelioma under presumption laws. Arizona, Texas and Oklahoma all have mesothelioma coverage. Firefighters in these states may also be covered under cancer presumption laws. So far, 37 states have passed their own version of this law, including the four states in this region. These laws allow firefighters to more easily receive workers’ compensation benefits after developing cancer as a result of their work, as long as they fit certain eligibility criteria. In general, most states stipulate a firefighter must have had a physical exam prior to service that showed no signs of cancer, and may also refute claims for those showing a history of tobacco use. 1 Arizona Department of Environmental Quality. Air Quality Division: Asbestos. 2 Centers for Disease Control and Prevention, National Center for Health Statistics. Underlying Cause of Death 1999-2015: Mesothelioma Underlying Cause of Death 1999-2015 on CDC WONDER Online Database, released December, 2016. 3 IAA Firefighters. Presumptive Health Initiative. 5 Mokdad AH, Dwyer-Lindgren L, et al. Trends and Patterns of Disparities in Cancer Mortality Among US Counties, 1980-2014. Journal of the American Medical Association. January 2017. Supplementary Online Content, 17. 6 New Mexico Environment Department. Asbestos. 7 Oklahoma Department of Environmental Quality. Asbestos. Updated August 26, 2015. 10 Texas Department of Health and Human Services. Asbestos Program. Updated September 28, 2017. 11 Texas State Historical Association. Nonpetroleum Minerals.